It becomes increasingly apparent that delays occur in physical and man-made systems due to various reasons including finite capabilities of information processing among different parts of the system, inherent phenomena like mass transport flow and recycling and/or by product of computational delays . Considerable discussions on delays and their stabilization/destabilization effects in control systems have commanded the interests of numerous investigators in recent years, see [81, 8, 22] and their references. In control design, it turns out that the design objectives have to incorporate the impact of parameter shifting, component and interconnection failures which are frequently occurring in practical situations. 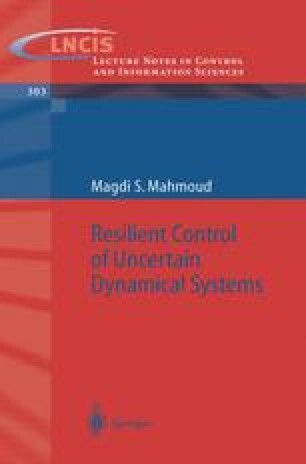 Robust control theory provides tractable design tools using the time domain and the frequency domain when the plant modeling uncertainty or external disturbance uncertainty is of major concern in control systems.